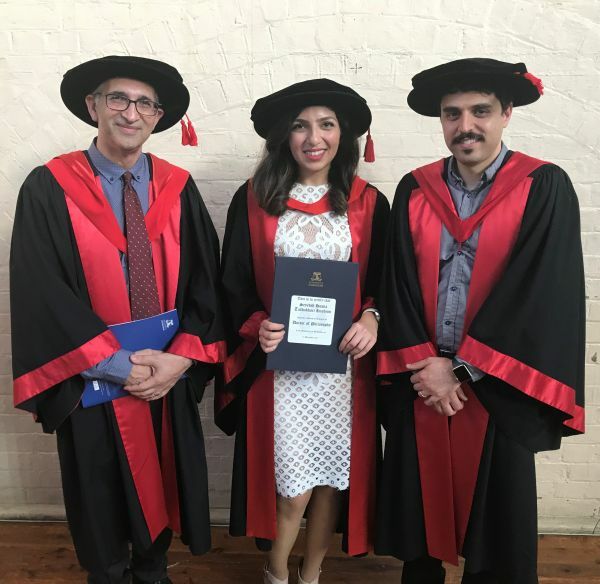 Congratulations to Dr Hosna Tashakkori Hashemi on receiving her Doctorate degree on Wednesday the 13th of December at the University of Melbourne. Hosna’s PhD thesis addresses the Indoor Search and Rescue Problem (SRP) by proposing a new 3D Indoor Emergency Spatial Model (IESM) that contains geometric and semantic information of building information required by emergency responders. IESM is leveraged for formulating and solving SRP using an ant colony based solution approach. The model is evaluated using a case study descriptive scenario method and experimental simulation. The results prove high efficiency of improving response time and situational awareness for indoor emergency response. Hosna’s experience in both industry and academia have given her a wide range of experience in Geospatial Solutions, Spatio-Temporal Data Analytics/Visualisation, Machine Learning, Optimisation, Intelligent Transportation Systems, Computer Networks, and V2X Communications. Hosna is currently working as a Geospatial Data Scientist at Aurecon Group.